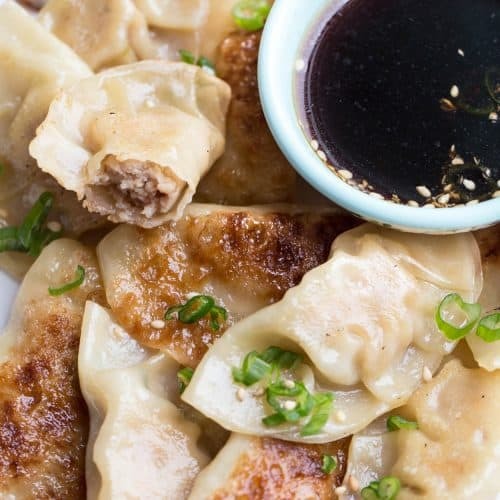 This Chicken Gyoza Recipe is amazing. The dumplings are crispy on the outside while the chicken is tender and juicy on the inside. 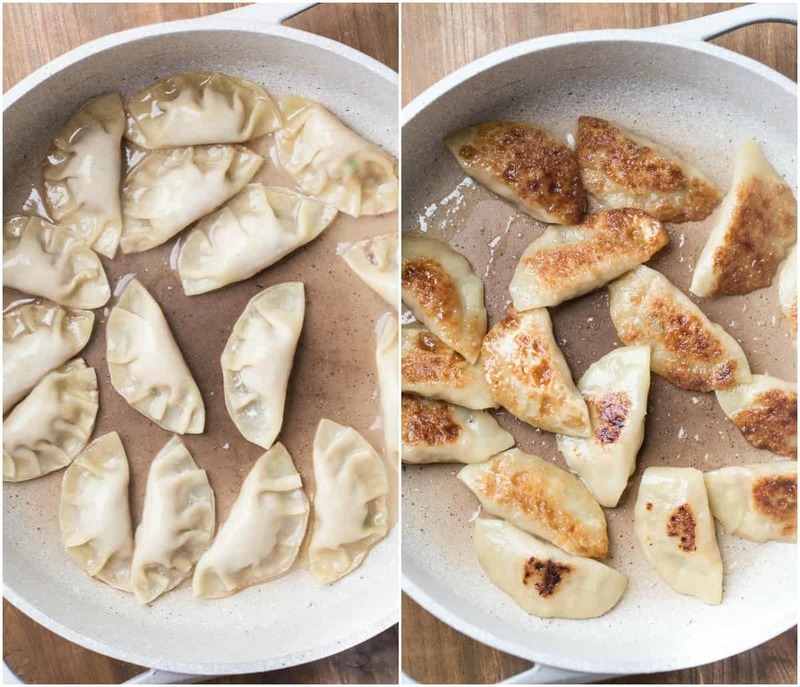 Cooked in a skillet, these gyozas are the perfect recipe for a quick dinner or a side dish when you don’t want to order take out. 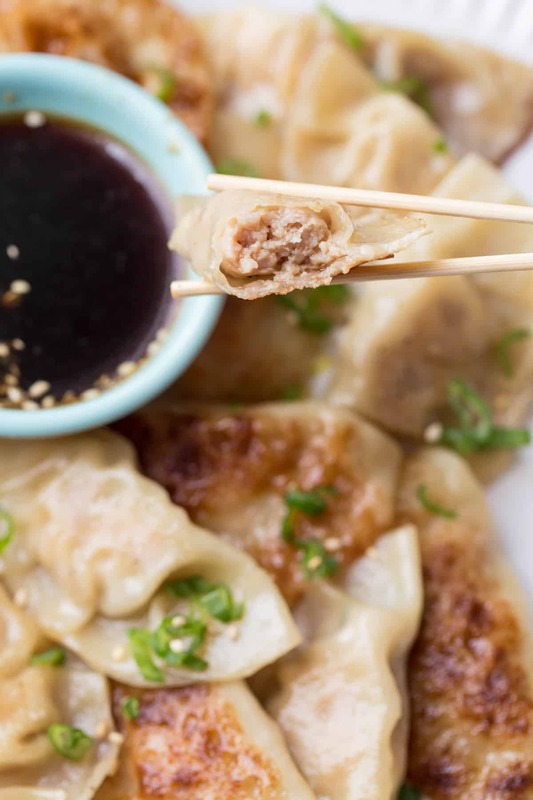 Try the Potstickers filled with pork if you enjoyed these gyozas. Gyoza is a thinly rolled out dough filled with ground meat, sealed and cooked. Though considered to be Japanese cuisine, they are similar to potstickers which originate from China. These gyozas are amazing. The dough is crispy when fried and the steaming allows the chicken inside to become so juicy and tender. When dipped into the gyoza sauce, the flavors are amazing. Gyozas may either be pan-fried or steamed. I like to get the gyozas crispy on one size then finish cooking them by steaming them. Combine all of the ingredients for the gyozas. Add meat to the wrappers and seal tightly. Fry gyozas on one side, add water and steam until fully cooked. TIP: Don’t overcrowd the pan. Cook in batches. Meanwhile, prepare the dipping sauce. Serve gyozas with the dipping sauce. TIP: Grinding fresh chicken meat makes a huge difference. We just ground fresh chicken thighs using a KitchenAid Food Grinder. 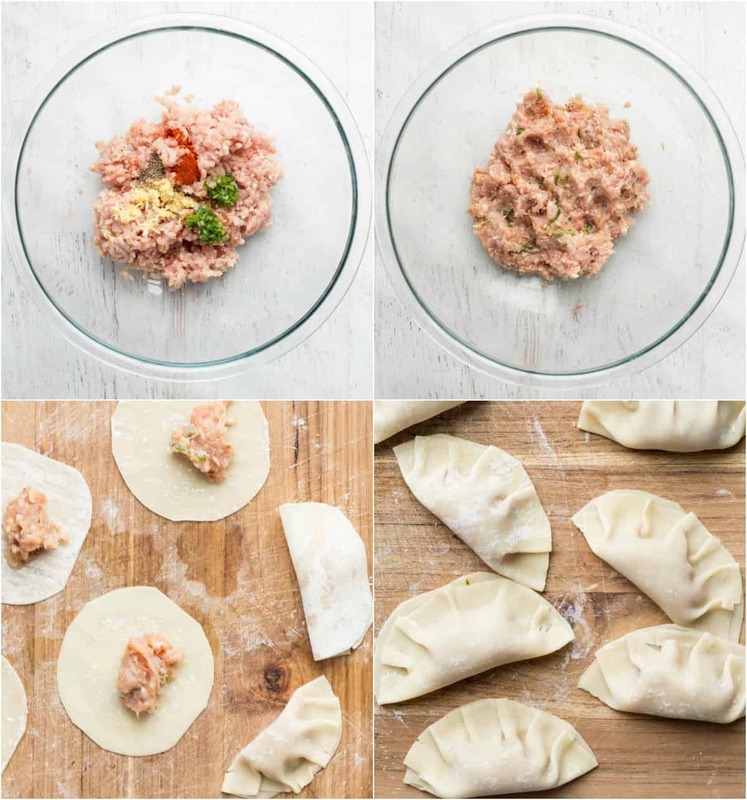 The gyozas may be filled using ground meat of choice. Though we used chicken, they can be filled with ground pork instead. 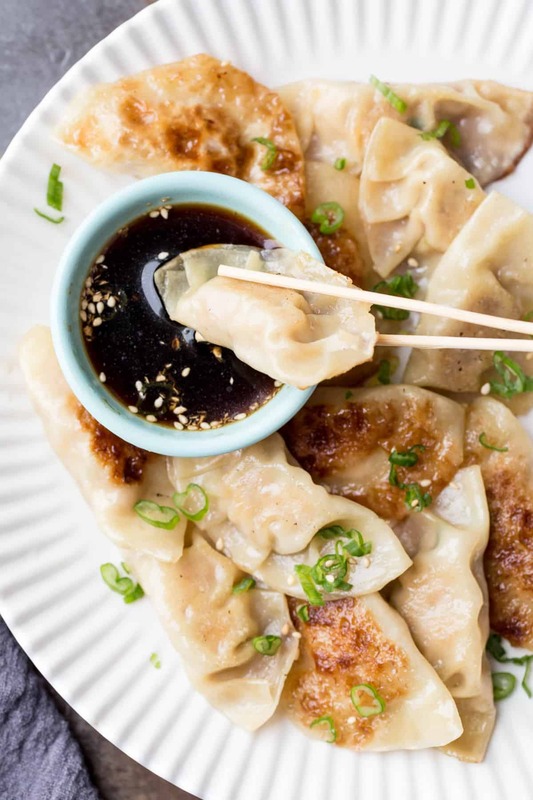 can you make gyoza with wonton wrappers? Yes! That is what we used when preparing this recipe. We don’t have gyoza wrappers in local stores. To use the wonton wrappers, I just trimmed the corners of the square to the shape round dough. Using kitchen shears makes this process quick and easy, just stack several wrappers together and trim. A good dipping sauce is vital when serving gyozas. This sauce is perfect. It’s not overpowering but adds the perfect finish to gyozas. Traditional gyoza dumplings have finely chopped cabbage in it, we like ours without the cabbage (our kids don’t like cabbage). You can add a few finely shredded cabbage leaves to the gyozas. NOTE: If you like the taste of sesame oil, add a teaspoon of sesame oil to the water when adding to steam the gyozas. Yes, gyozas freeze really well. Prepare the gyozas per instructions until cooking step. Line a baking sheet or cutting board with parchment paper and lightly dust with flour so they don’t stick. Freeze then transfer to a freezer bag. 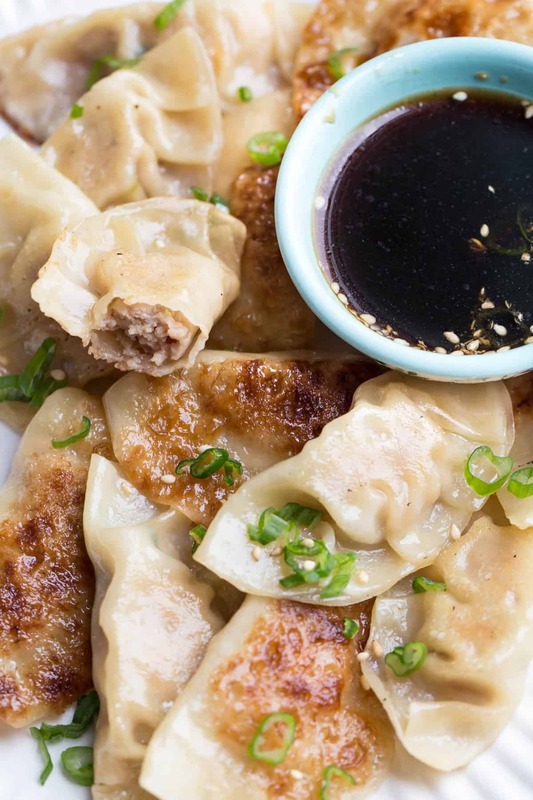 To enjoy, don’t defrost gyozas, just add an additional 1-2 minutes to the cooking time. Spicy Chicken Quesadilla– CopyCat Taco Bell recipe. Savory Crepes– With the most unique filling. Uzbek Samsa– A Mediterranean dish. 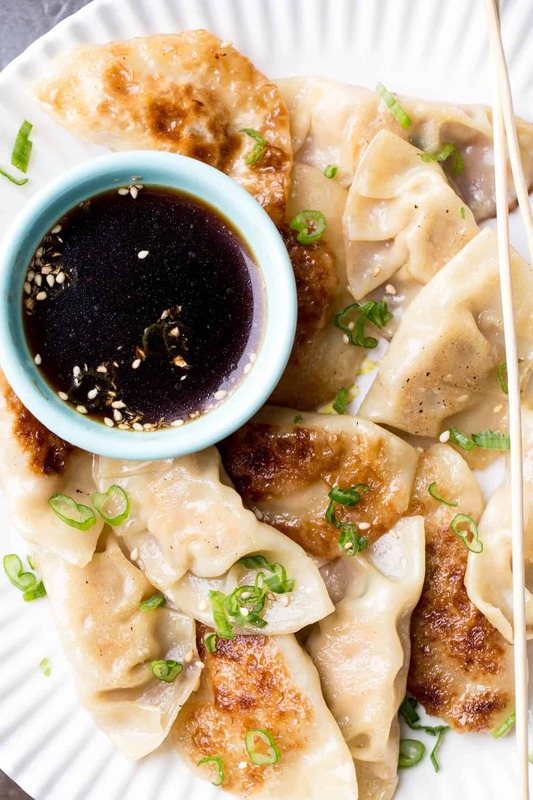 This Chicken Gyoza Recipe is amazing. The dumplings are crispy on the outside while the chicken is tender and juicy on the inside. In a bowl, combine all the ingredients for the gyoza filling. Layout gyoza wrappers. Add a teaspoon of filling in the center of each wrapper. Dip finger in water and run it around the edge of the gyoza wrapper. Fold the wrapper over and seal securely. Heat 1 tbsp oil in a large skillet. Once the oil is hot. Add gyozas. Cook for about 2 minutes. Flip gyozas and add 1/3 cup water and close skillet with a lid (add 1 tsp oil mixed with water if you like the taste of sesame oil). Cook for 2-3 minutes. Repeat with remaining batches. In a skillet, combine and heat all ingredients for the gyoza sauce. Bring to a low boil then remove from heat. Serve warm or cold.